NACUBO’s Matt Hamill discusses governance and endowment management at a forum in St. Petersburg. In an effort to expand NACUBO’s relationship with higher education institutions and other organizations in Russia, Matt Hamill, senior vice president, advocacy and issue analysis, met with three different groups in Moscow and St. Petersburg during a five-day visit to Russia in October 2013. Hamill spoke on philanthropy in the United States and its role in society at a conference attended by 200 people in Moscow and organized by the Russia Donors Forum, an association that aims at promoting charitable activities, and standards and ethics in the philanthropic field. Philanthropy is a growing area in Russia, where private wealth is accumulating in larger cities and individuals are becoming more open to giving. In another event in Moscow presented by the Endowment Club, whose members include organizations that have small endowments or are planning to set them up, Hamill discussed how endowments are organized in private and public sectors in the United States. 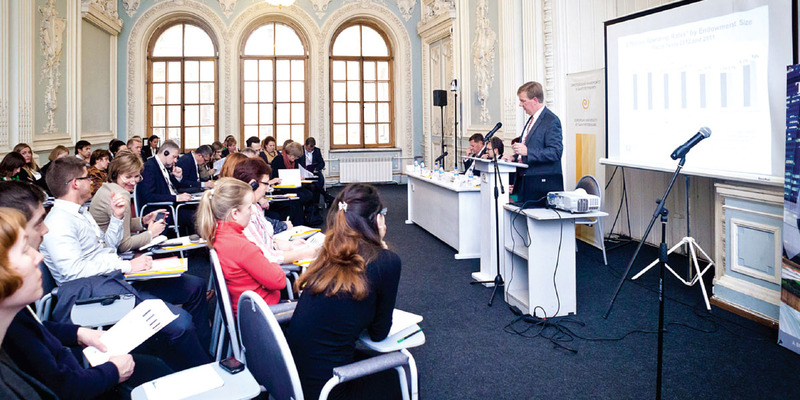 At a third event, Hamill spoke about governance and endowment management at a forum organized by the European University at St. Petersburg for all universities in that city. NACUBO is exploring a possible visit by officials from Russian universities to meet university campus leaders and business officers in the United States. It is also looking into customizing existing NACUBO publications on endowments for use by Russian universities. For more information, contact Matt Hamill at mhamill@nacubo.org. Join us on February 18 for a webcast on the results of the 2013 NACUBO-Commonfund Study of Endowments. You’ll also hear about the challenges that investment experts and chief business officers will likely encounter in the coming years. A panel of industry and institutional experts will discuss how endowments performed in 2013 and the asset allocation strategies that had the highest returns. Participants will gain an understanding of the biggest challenges for 2014 and how they can position themselves to take advantage of opportunities. NACUBO recently held webcasts on developing a market-informed approach to tuition pricing, and innovative ways to save energy costs. In the first webcast, attendees learned about how market inputs guide pricing and aid strategies at institutions. Speakers discussed how they use market-informed pricing data to inform and educate board members, state legislators, and other constituents about viable, long-term pricing strategies. Speakers were Rick Hesel, principal at the Art & Science Group Inc.; Karen Foust, vice president for enrollment and dean of admission and financial aid, Hendrix College, Conway, Arizona; and Stephen Farmer, vice provost for enrollment and undergraduate admissions, University of North Carolina at Chapel Hill. The second webcast focused on how Valencia College, Orlando, Florida, decreased its energy usage by half over the past five years by implementing a three-phased approach that employed strategic behavioral changes. Attendees learned how to implement shutdown procedures, evaluate unoccupied building space, conduct energy audits, and adopt institutionwide guidelines for energy efficiency. Keith Houck, vice president for operations and finance, and Patty Riva, program manager, Valencia College, were the speakers. 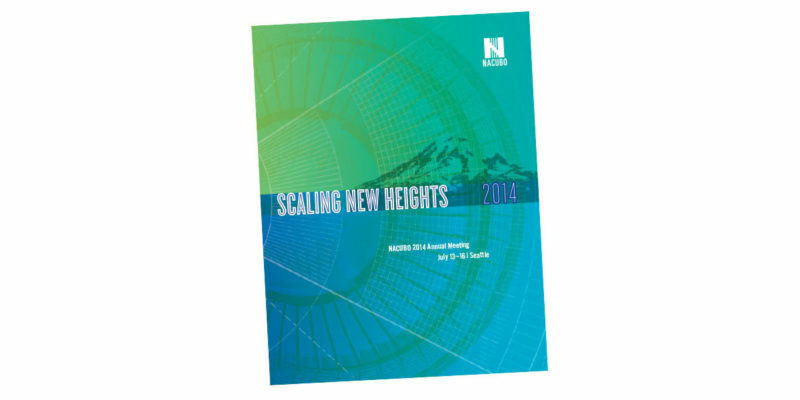 Plan to attend the NACUBO 2014 Annual Meeting, July 19–22,in Seattle. Check www.nacuboannualmeeting.org and future issues of Business Officer for details and updates. 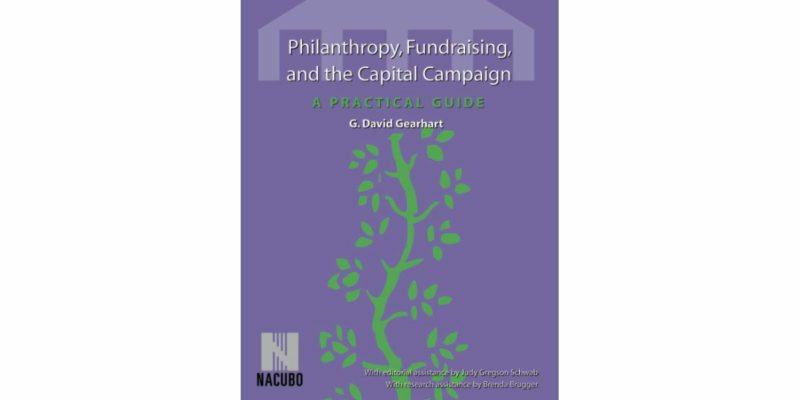 NACUBO is offering Philanthropy, Fundraising, and the American Capital Campaign: A Practical Guide by G. David Gearhart, a book that discusses steps to successful campaigning from the ground up. It offers topics such as campaign readiness, setting up a strong internal structure, the advantages of volunteers, and staying on top of financial details. It also includes a CD with more than 40 campaign tools. Member cost is $41.22; nonmember, $52.46. If you’re looking for updates on endowment and debt management, sponsored cost research accounting, or the latest in student financial services, then plan to attend the following events scheduled for February and March. Attendees at NACUBO’s Endowment and Debt Management Forum 2014 to be held February 5–7 at the Waldorf Astoria in New York City, will be able to interact with campus financial leaders who manage significant endowment and debt portfolios, as well as finance and global investment experts and thought leaders from the media and government. The forum will examine pressing issues of endowment management, debt capacity, and leadership. It will focus on actionable steps that attendees can take back to their organizations to drive increased performance. Speakers include three well-known finance veterans: Sam Stovall, chief equity strategist, S&P Capital IQ’s Equity Research Group; Ronald G. Ehrenberg, Irving M. Ives Professor of Industrial and Labor Relations and Economics, Cornell University, Ithaca, New York; and Nancy Pfund, founder and managing partner, DBL Investors. General session speaker Bruce Weinstein, the Ethics Guy, will help attendees understand ways to lead their staffs more effectively. He will show how five simple principles can help them bring out the best in others and in themselves. This workshop, to be held March 3–5 in Miami, is essential for those new to the long-form methodology or for those who need to gain a better understanding about sponsored research cost accounting. The program provides an overview of cost accounting and essentials of developing and allocating facilities and administrative (indirect costs) required by the Office of Management and Budget Circular A-21. Participants also learn the fundamentals of cost pools, proposal preparation, rate negotiation, and audit considerations. Other topics include base cost development, department administrative expenses, operation and maintenance costs, fringe benefits, space, depreciation, libraries, service and recharge centers, cost sharing, unallowable costs, direct costs, and regulatory updates. Attendees have the opportunity to interact with colleagues, discuss strategies with experienced faculty members, and review a case study for in-depth learning. The Student Financial Services Conference in Anaheim, California, March 9–11, will present new strategies and solutions as well as best practices. Attendees will learn how to identify patterns that shape various aspects of their lives. They will then discover why these habits exist and how they can be changed to transform institutions, communities, and lives. General session speaker Bruce Weinstein will help attendees understand ways to lead their staffs more effectively. At the core of the conference is a robust collection of concurrent sessions. Hear how one institution used scenario-based training to help staff better develop problem-solving skills. Learn how to develop an engaging financial literacy course—dense with content—by drawing on the expertise around your campus, rather than shouldering the burden yourself. You’ll also explore complexities of billing and collecting from international students, including the various rules and regulations other countries impose on debt collection. As always, there are plenty of opportunities to network with colleagues, including in the Expo Hall, where you’ll have the chance to meet with representatives from 35 companies that provide services to SFS offices across the nation. Additionally, there will be several roundtable discussions allowing attendees to share ideas with colleagues. For those new to student financial services or for those just wanting a refresher, the Bursar Fundamentals program on March 9 provides a comprehensive look at the role of the bursar on campuses—large and small. Attendees will gain a better understanding of student accounts—including invoicing, aid, payments, and collections—as well as loan administration techniques, customer service strategies, and federal regulations. To register for any of these workshops or for more information, visit www.nacubo.org or call 800.462.4916. Due to the growing interest from our member institutions on responsibility center management, NACUBO recently created an RCM eGroup for you to share content, make contacts, and get involved in discussions with your colleagues on this important topic. Join today at http://my.nacubo.org/nacubo/egroups/mysubscriptions.